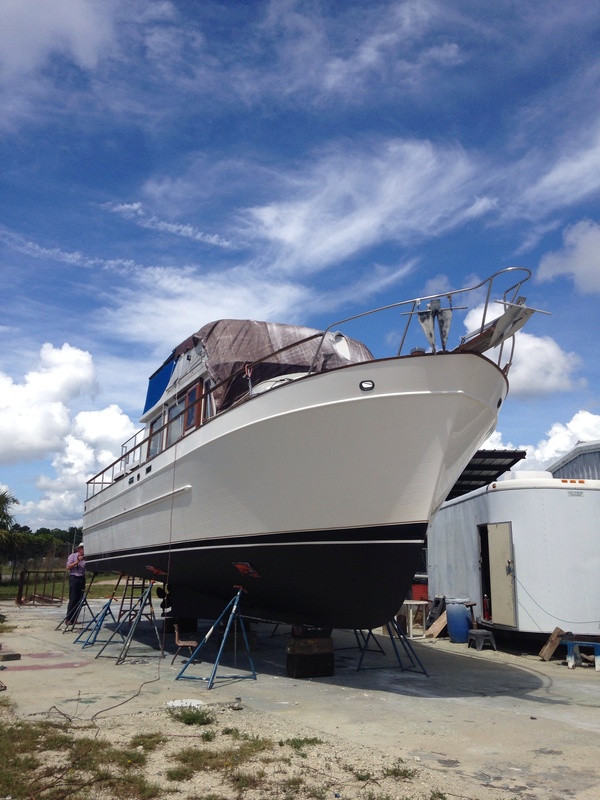 After a few days with the family in Centreville, we headed to Jacksonville to pick up the boat. One of my favourite books as a child was ‘What Katy Did at School’ by Susan Coolidge, in which the eponymous heroine and her sister Clover undertake a 3-day journey from their home in the American Midwest to boarding school in Connecticut. 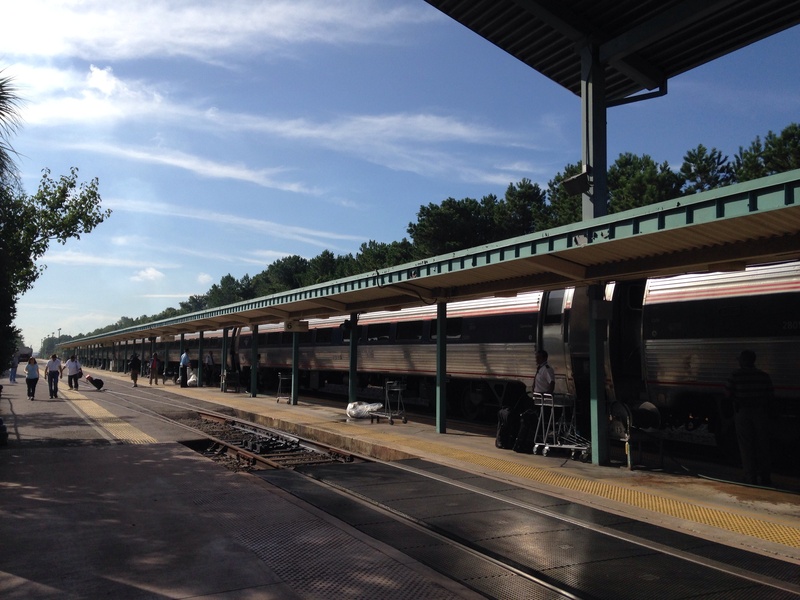 The account of this journey had made a vivid impression, so I felt quite excited 55 years later, when Ian announced that rather than flying from DC to Jacksonville, we would take the overnight train. 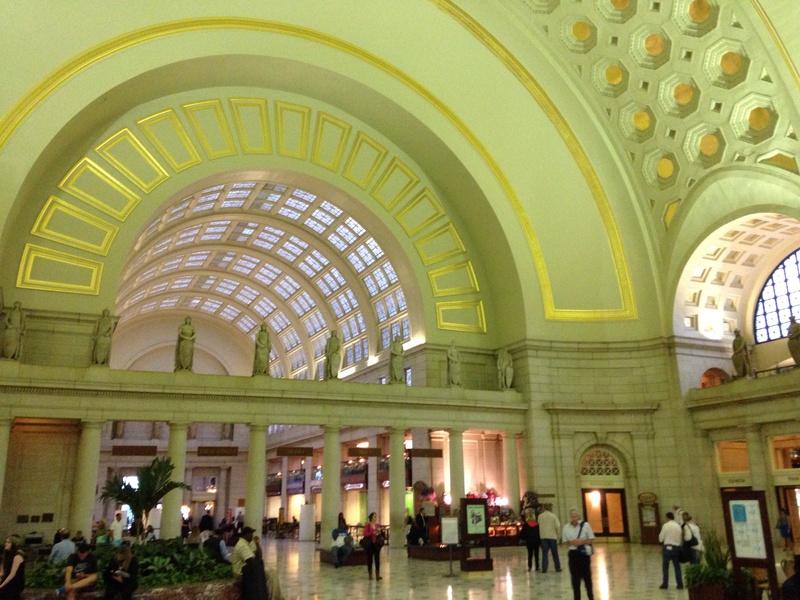 Union Station in Washington DC is a monument to the Beaux Arts architecture of the late 19th century, and was opened in 1907. After falling into disrepair, it was beautifully restored in the 1980s. Our pleasure in our surroundings was tempered by an announcement that our train was delayed (length of time unspecified), and a series of graphic public information videos on the themes of What to Do in the Event of a Terrorist Attack and What to Do if You are Confronted by a Lone Gunman (try to send a text to the given number, without the gunman noticing you are using your cell-phone). Maybe there is evidence that in some way these videos help to prevent such atrocities, and help the public to deal with them, but personally I think they serve only to heighten anxiety, out of proportion to the actual risk involved. Or one hopes so, anyway. Eventually we were called to board. Like most American trains, the Silver Meteor was very long indeed and we walked at least a quarter of a mile along the platform before finding our coach. Unlike most British stations, there were numerous people to help us, and we were introduced to James, our attendant, who would look after us throughout the journey. Getting on the train required the ascent of at least five steep steps, quite a challenge with 23 kilos of luggage in your hand. ‘Don’t worry Ma’am, I’ll throw it up to you,’ James assured me, and he did. Financial prudence had apparently dictated that a room on the train would be an extravagance too far at this stage of the trip, and a ‘roomette’ would suffice, though we did have some misgivings about how we, and all our baggage, could fit into such a small space. The roomette seemed to consist of two seats facing each other, and not much else. All was soon revealed, when James came along to show us where the light switches were and how the air-conditioning worked. While we were at dinner, he would magically convert the seats into bunks, and make them up for us. Eventually we were enlightened on the burning question of toilet facilities. The little shelf next to my seat, on which I had carelessly dumped my bag, was actually the lid of the toilet seat. Above it was an ingenious fold-down sink. The nearest toilet offering any seclusion was several carriages further down the train. 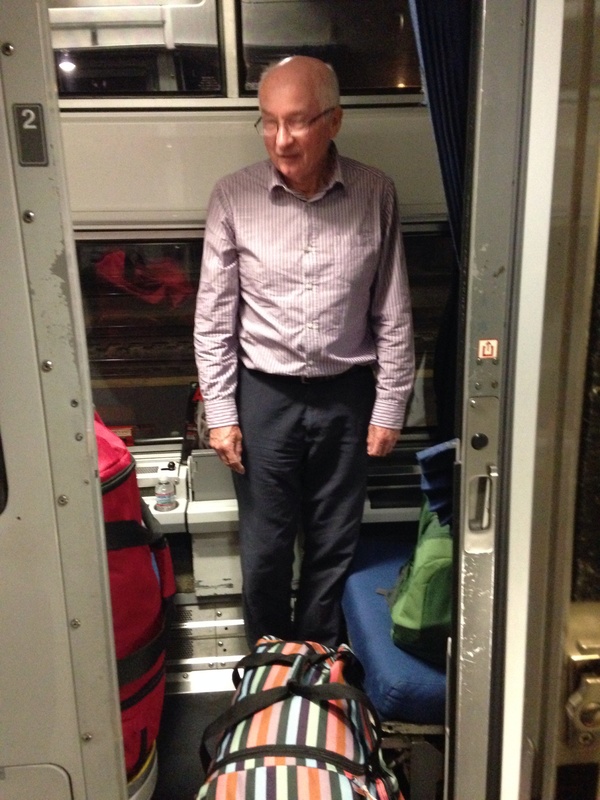 It soon became obvious that the roomette would not accommodate us and our 46 kg of luggage, but James had the answer to this too, and checked them into the guard’s van for us. We would see them next on the platform of Jacksonville Station. Ian trying to turn round in the roomette. Another of my pre-departure worries had concerned the quantity and quality of dinner, but this proved an unnecessary concern. The dining car had a pleasant ambience, dinner was ample and satisfying,the service very good, and conversation was enlivened by the presence on our table of two young sisters from New Zealand who were travelling round the US. Discussion ranged from places of mutual interest that we had all either visited, or intended to visit (New Orleans, Charleston, New York, Boston), to the problems facing small independent countries, like New Zealand and possibly Scotland. Sleeping in the roomette was quite challenging, but once I had remembered how to turn off the fierce air-conditioning, and managed to ignore the diverse rattlings and rumblings of the train, I must have dropped off, as suddenly Ian was telling me that it was 7.30 and we had already left Savannah. I looked out of the window at the flat marshland and tall trees of Georgia that in a few weeks’ time we would be travelling through on the boat. Soon the wild scenery changed to the more cultured and semi-tropical Florida landscape. In contrast to the grandeur of Union Station, the Amtrak Station at Jacksonville was more like a country halt, just two platforms and a waiting room, but like most places here, well-kept, and the palm trees and sudden humid warmth gave a slightly exotic feel. Carina had been having her bottom re-surfaced while we were at home, so as soon as we had checked into the hotel we were off to see her. I had been worried that in the heat and humidity of the Florida summer, large quantities of mould might have accumulated, not to mention a possible proliferation of insect life. But Ian was pleased with the work that had been done, and apart from a few dead ants, the inside of the boat was more or less as we’d left it. After a couple of days’cleaning, re-stocking and doing various mechanical jobs, we were ready to roll. Oh Jane, I loved the Katy books too. I’ve been looking forward to reading these accounts and loved this one. 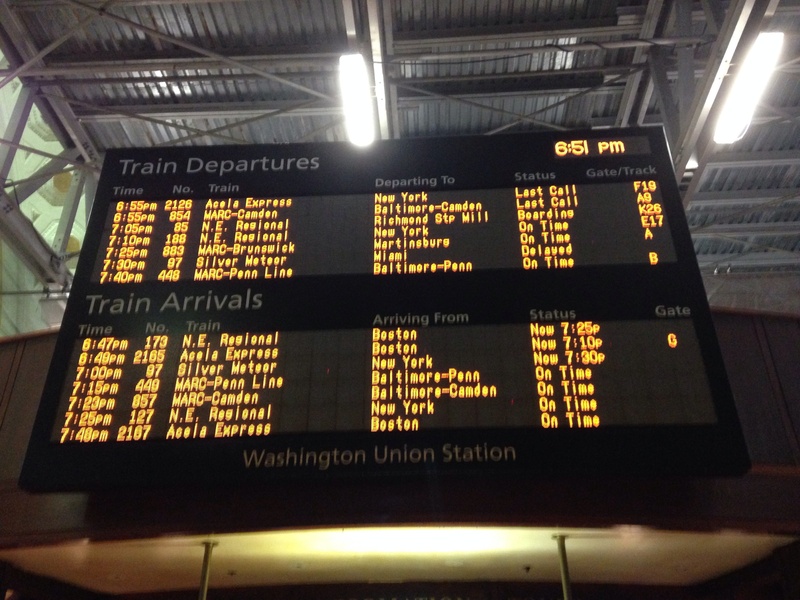 The station at DC sounds and looks amazing, I’d love to visit again. The contrast between the usual excellent American customer service and the scary traveller warnings made me smile. I’m sure those Northumbrian stiff upper lips allowed you to ignore them! Thank you Jane – I’m afraid the next instalment may turn out to be an account of how we managed to amuse ourselves while stranded for a week in Jacksonville! There’s a very old railroad bridge over the St John River, which we were intending to pass under today on our way north. The bridge is only about 6 ft above the water and has to be lifted to allow boats to pass through…….and it’s been locked, in the down position, for the last week!! According to the notice at the marina, repairs could take another week! Ian has just gone to the office to get the latest….. watch this space! Oh my goodness! I hope your Kindle is well loaded. Love the way you can walk across the tracks at Jacksonville. Yes I must admit we were thkinking of you Sheila and your privations in Siberia and counting our blessings! Lovely to see your blog back again Jane. Adrian interested in the pic of the Washington station. We complain about the anxiety-inducing announcements on Midland Mainline but your terrorist videos take the biscuit! Good luck with the bridge repairs.